The Crafty Nurse here with a technique from the Simple & Easy Inking CD, called "Background Pop." This technique is great for using background stamps like the new "Pom Pom Swag" released just this month over at the Technique Junkies site. After inking the "Pom Pom Swag" background twice, I stamped the super fun "Incrediball Canning Jar Set of 2" and heat embossed with clear over black Versafine ink. 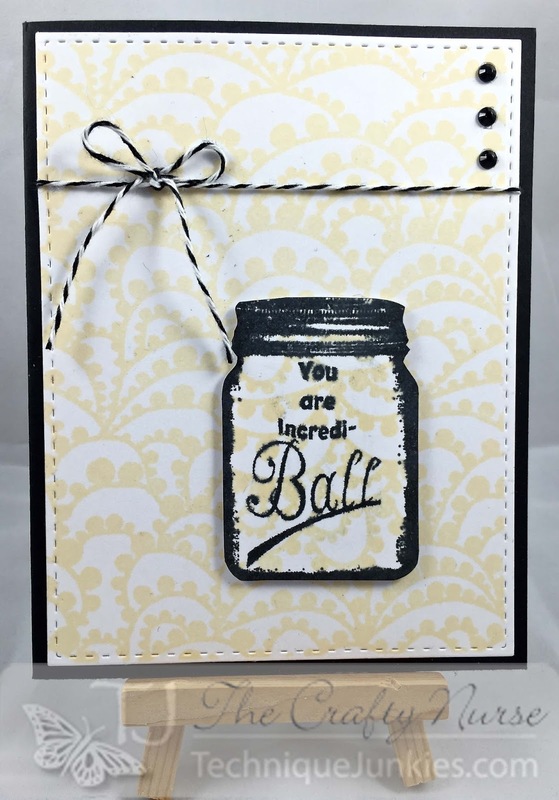 I kept the card very basic and finished off with some black bakers twine and a few black pearls. If you haven't checked out the October New Release, I encourage you to do so over at the Technique Junkies store.